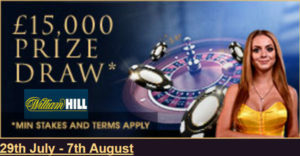 Another cracking prize draw from William Hill live casino. This time there’s £15,000 up for grabs and there’s 144 cash prizes up to £500. Last place still gets a whopping £100 cash. The promotion is running from Friday 29th July 2016 until Sunday 7th August 2016. To enter all you have to do is be logged into your account and hit the “Claim Now” on the promotion website. 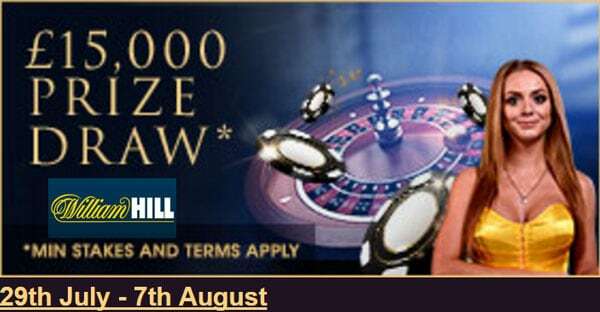 Then for ever £10 you wager on one of the Live Casino tables at Vegas, Macau & Mayfair, you’ll get one entry into the prize draw. The draw will take place 48 hours after the promotion ends. 144 tickets will be drawn randomly and the winners will be notified by email. 4th – 144th wins £100. Terms & conditions apply, so please make sure you understand them before entering. 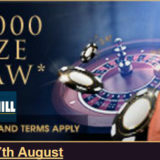 As is normal with these types of promotions there are restrictions on the type of bets you can place. Non Risk type bets, where you bet on both sides of an each way bet, like Red & Black or Odd and Even in Roulette will not be accepted. The terms and conditions have a longer list, but I think you get the jist of what’s acceptable and what’s not.